Session 9 - Animal-Machine Close Encounters? Environmental Interactions of Marine Renewables (EIMR) is an international conference series hosted across the Highlands and Islands of Scotland. Previous conferences in Kirkwall, Orkney (2012) and Stornoway, Lewis (2014) – hosted by Heriot-Watt University (HWU) and the University of the Highlands and Islands (UHI) – explored the interactions of wave and tidal energy technologies with the environment. Since then, wave and tidal testing and commercial deployments have progressed in Scotland and worldwide. Marine renewable energy – meeting the expectations of the Highlands and Islands? Can tidal stream turbines change the tides in the Pentland Firth, and is there an acceptable limit? Monitoring the environmental interactions of tidal devices - how do we achieve what is required in a practical and cost effective manner whilst retaining focus on the key issues to assist the consenting of future projects? Climate change and its influence on future ocean wave conditions have been investigated for various regions of the globe. To the authors’ knowledge such studies have yet to be conducted for Orkney waters, yet with 600MW of wave power capacity proposed in the area it is important to understand how the available resource will change. Venugopal and Nemalidinne, (2015) and Venugopal et al., (2017) recorded the development and validation of a spectral wave model of the North Atlantic for the purpose of assessing wave energy resource on the coast of Scotland. In this work we describe modification of this model to anticipate the effects of future climate, by adjusting the surface wind forcing. This adjustment was based on the changes in wind speeds that are predicted by a CMIP5 general circulation model under the RCP8.5 scenario. 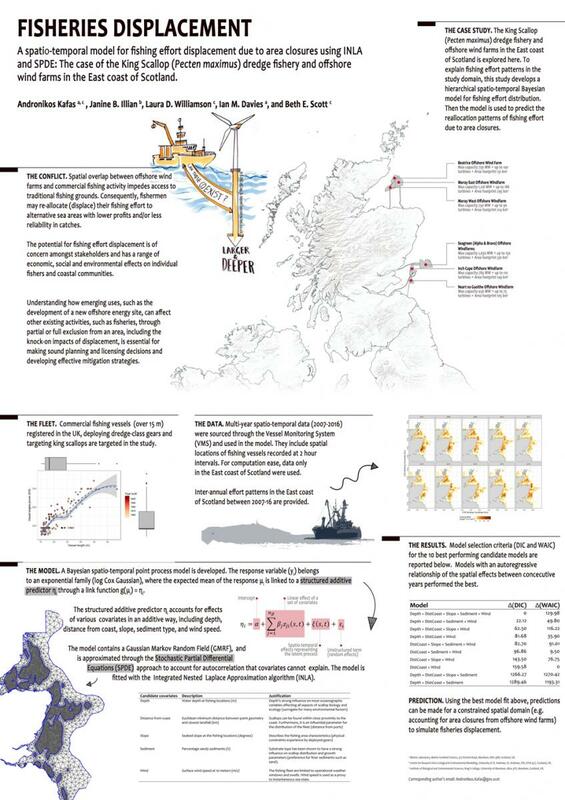 Predicted changes to the wave environment of Scottish inshore waters will be reported, and implications for wave energy discussed. The introduction of a new marine activity in Maritime Spatial Planning often imposes spatial restrictions on existing users. Spatial overlap between emerging offshore renewable energy developments in Scotland and commercial fishing activity impedes access to traditional fishing grounds. Consequently, fishermen may re-allocate (displace) their fishing effort to alternative sea areas with lower profits and/or less reliability in catches. The potential for fishing effort displacement is a significant concern amongst stakeholders and has a range of economic, social and environmental effects on individual fishers and coastal communities. Understanding how emerging uses, such as the development of a new offshore energy site, can affect other existing activities, such as fisheries, through partial or full exclusion from an area, including the knock-on impacts of displacement, is essential for making sound planning and licensing decisions and developing effective mitigation strategies. To explain fishing effort patterns, this study develops a hierarchical spatio-temporal Bayesian model for fishing effort distribution, based on multi-year spatio-temporal data for Scottish fishing vessels (VMS data). Then the model is used to predict the reallocation patterns of fishing effort due to area closures. We use a spatial point process model that contains a Gaussian Markov Random Field, approximated through the Stochastic Partial Differential Equations approach, to account for autocorrelation that covariates cannot explain. The model is fitted with the Integrated Nested Laplace Approximation algorithm. The model accurately explains fishing effort patterns and predicts changes in space (approx. 5 km2) and time (annually) in response to area closures from offshore wind farms. The study helps evaluate economic impacts on the fishing fleet and environmental impacts from different layout options and as a result aid commercial fisheries mitigation. The model can be easily transferable to other fisheries management interventions resulting in area closures, hence providing a powerful analytical tool for fisheries management. Unlike many other potential environmental risks for marine energy (e.g., collision, entanglement), the acoustic stressor from wave and current energy converters can be readily quantified. This requires instrumentation systems capable of operating in energetic waves and currents and obtaining measurements in which propagating sound is masked by neither flow-noise nor self-noise. However, once such measurements have been acquired, it can be difficult to ascribe acoustic events to a marine energy converter. The Drifting Acoustic Instrumentation SYstem (DAISY) is being developed to address these considerations. Each DAISY consists of a surface expression with position tracking, coupled, via a suspension system, to a submerged element with a hydrophone and ancillary sensors (e.g., orientation, pressure). In waves, the suspension system is a mass-spring-damper that isolates the hydrophone from surface motion in a manner analogous to a sonobuoy. In currents, the suspension system is simpler, consisting of a combination of static and dynamic line, but the hydrophone is enclosed by a flow-shield that also acts as a drag element to minimize relative velocity between the submerged element and surrounding water. Data streams in the surface expression and submerged element are integrated by microcomputers which synchronize the data streams and allow the condition health of a DAISY to be monitored throughout a field deployment. Machine learning will be used in post processing to isolate acoustic events, and long baseline localization using data from multiple DAISYs will be able to identify their source. Field experiments that demonstrate the self-noise and flow-noise reductions achieved by the DAISY relative to earlier variants of drifting instrumentation systems are shown. Finally, the applicability of drifting acoustic measurement systems to meet draft international standards will be summarized. Tidal-stream energy devices will introduce underwater noise into the environment, the magnitude of which is of particular interest because of the potential effects on acoustically sensitive species such as marine mammals and fish. Thus, acoustic emissions of these devices need to be assessed in terms of their potential negative impact, as well as a means for device detection for collision avoidance in these often naturally noisy environments. Using drogue-mounted, drifting hydrophones, underwater noise (10Hz to 78kHz) was recorded during tests of the PLAT-O tidal platform fitted with two 50kW SIT SCHOTTEL Instream turbines. The rotors of each three bladed horizontal axis turbine was 5m diameter. During trials at a test site off the Isle of Wight in 2015 with both turbines operating, stepwise frequency- modulated tonal signals with most energy between 1 and 2.5kHz, but extending as low as 200Hz were recorded. At a median distance of 280m sound pressure levels (SPL dB re 1 μPa) in the dominant third- octave bands (1-2.5kHz) were elevated by as much as 10-15dB compared to baseline ambient noise levels. At lower frequencies (200-400Hz) noise levels were about 2-5dB over ambient noise levels. Recordings at different ranges from the platform indicated that at a distance of about 500-600m noise levels emitted by the turbines may be expected to be equal to or below ambient noise levels in this environment. Potential impacts and detection of this device by marine species will thus likely be at least up to a couple of hundred metres from the source. Since there was little ancillary information available on the mechanical operation of the turbines being tested during this experiment the data reported here are preliminary and future acoustic measurements of these turbines deployed at PLAT-I, the successor of the PLAT-O platform, are currently underway. Canada has in the Bay of Fundy one of the world's richest tidal resources and a world- leading test site for large grid-connected in-stream tidal turbines. But decisions regarding the development and regulation of the tidal energy industry are hindered by a lack of scientific evidence related to animal/turbine interactions and flow variability. The primary goal of the research planned for 2018-2023 is to address the two challenges facing tidal energy development: the impact of the environment on turbines and the impact of turbines on the environment. Both require a highly integrated suite of field work infrastructure that will quantify the high-flow, dynamic environment of Minas Passage, including measuring flow velocities, mapping the sea bottom, detecting the presence of marine mammals, tracking fish and monitoring the noise generated by turbines. Both challenges also require substantial computing infrastructure to conduct high-resolution numerical simulations and to analyze the large quantities of collected data. Field projects will utilize robotic watercraft, drifting buoys and a rigid-inflatable boat, all outfitted with acoustic devices to measure flow speed, turbulence, underwater noise and seabed change, and drones to provide video aerial imagery. State-of-the-art, fish-tracking technology and imaging sonars will collectively give a detailed picture of how fish and marine mammals interact with turbines. Together, the system will quantify and map the spatial distribution of turbulence, noise and marine animals at the FORCE test site. To complement the field work, high-end computing infrastructure will be used to run simulations of turbines operating in the turbulent flow field, to generate accurate ocean forecasts necessary for marine operations and to simulate the impact of commercial-scale turbine arrays on marine life.